Chronic inflammatory airway diseases including asthma are characterized by immune dysfunction to inhaled allergens. Our previous studies demonstrated that T cell priming to inhaled allergens requires LPS, which is ubiquitously present in household dust allergens. In this study, we evaluated the role of vascular endothelial growth factor (VEGF) in the development of T cell priming and its polarization to Th1 or Th17 cells when exposed to LPS-contaminated allergens. An asthma mouse model was induced by airway sensitization with LPS-contaminated allergens and then challenged with allergens alone. Therapeutic intervention was performed during allergen sensitization. The present study showed that lung inflammation induced by sensitization with LPS-contaminated allergens was decreased in mice with homozygous disruption of the IL-17 gene; in addition, allergen-specific Th17 immune response was abolished in IL-6 knockout mice. Meanwhile, in vivo production of VEGF was up-regulated by airway exposure of LPS. In addition, airway sensitization of allergen plus recombinant VEGF induced both type 1 and type 17 Th cell (Th1 and Th17) responses. Th1 and Th17 responses induced by airway sensitization with LPS-contaminated allergens were blocked by treatment with a pan-VEGF receptor (VEGFR; VEGFR-1 plus VEGFR-2) inhibitor during sensitization. These effects were accompanied by inhibition of the production of Th1 and Th17 polarizing cytokines, IL-12p70 and IL-6, respectively. These findings indicate that VEGF produced by LPS plays a key role in activation of naive T cells and subsequent polarization to Th1 and Th17 cells. The default immune response to the inhalation of innocuous proteins (allergens) is nonresponsiveness (i.e., tolerance) (1, 2). As inhaled allergens are ubiquitous in the environment, it remains unclear why some individuals develop T cell priming to allergens whereas others do not. Asthma is a very common chronic disease involving the respiratory system in which the airways occasionally constrict, become inflamed, and are lined with excessive mucus, often in response to inhaled allergens (3). In terms of the development of asthma, T cell priming to inhaled allergens is critical in the initiation and orchestration of inflammatory responses in asthmatic airways (4, 5). However, the precise mechanisms of T cell priming to inhaled allergens are still controversial. LPS, a cell wall component of gram-negative bacteria, is ubiquitously present in the environment and also in household dust allergens, such as house dust mites (6). LPS is one of the pathogen-associated molecular patterns that produce proinflammatory and immune-modulating mediators (1, 6). The “hygiene hypothesis” suggests that the rising incidence of allergic asthma is causally related to reduced infectious burden in Westernized countries (7). However, recent evidence indicates that house dust LPS is associated with asthma severity in both adults and children (6), and that infectious burden in early childhood is positively associated with the development of allergic asthma (8, 9, 10). In addition, our recent animal studies demonstrated that T cell priming to inhaled allergens requires LPS (11). However, the precise mechanisms by which LPS induces T cell priming to inhaled allergens are not completely understood. The Th2 hypothesis of asthma pathogenesis states that asthma is caused by an increase in Th2 response in combination with a decrease in Th1 response (12). Although data from animal experiments support the Th2 hypothesis, studies in humans have indicated that the expression of IFN-γ (a Th1 cytokine) is elevated in the blood and the airways, especially in patients with severe asthma (11, 13, 14). Our recent human data indicated that sputum neutrophils rather than eosinophils are associated with the severity of asthma (11). Recently, another subset of T cells that produce IL-17 (Th17 cells) has been identified (15). IL-17 has pleiotropic activities (16), and is involved in the proliferation, maturation, and chemotaxis of neutrophils (17). Expression of IL-17 has also been detected in target tissues of asthma patients (18). Although there is ample evidence supporting the suggestion that Th17 cells are potent inducers of neutrophilic inflammation (15, 19), the role of IL-17 in the pathogenesis of asthma has not been investigated in detail. Vascular endothelial growth factor (VEGF)3 was originally described as vascular permeability factor based on its ability to generate tissue edema (20). Exaggerated levels of VEGF have been detected in tissues and biological samples from patients with asthma (21, 22). Our previous lung-specific transgenic experiments showed that high levels of VEGF in the airways induce lung inflammation and enhance T cell priming to inhalant allergens (23). Moreover, human genetic studies have found that genetic variations of VEGF receptors (VEGFRs) are associated with sensitization to common inhalant allergens in the general population (24). We hypothesized that LPS-induced VEGF is the most upstream mediator in the development of T cell priming to inhaled allergens and its polarization to Th1 and Th17 cells when exposed to LPS-containing allergens. To test this hypothesis, we evaluated the role of VEGF- and VEGFR-mediated signaling in the proliferation of naive T cells and subsequent differentiation to Th1 and Th17 cells from primed T cells using a mouse model of asthma induced by airway sensitization with LPS-containing allergens. IL-17 knockout (KO) mice (BALB/c background) were gifts from Y. C. Sung (POSTECH, Pohang, Republic of Korea), and IL-6 KO mice (C57BL/6 background) were purchased from The Jackson Laboratory. Mice were bred in pathogen-free facilities at POSTECH. All live animal experiments were approved by the Pohang University Science and Technology (POSTECH) Ethics Committee. LPS was purchased from Calbiochem. OVA and SU5416 (inhibitor of both VEGFR-1 and VEGFR-2 signaling) were from Sigma-Aldrich. Recombinant mouse VEGF164 was purchased from R&D Systems. A noneosinophilic asthma model induced by sensitization with LPS-contaminated allergens was generated as described previously (11). 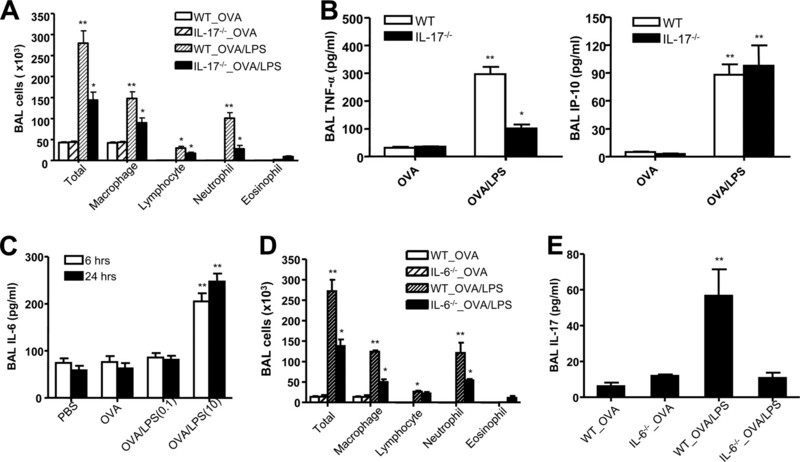 In brief, 6-wk-old mice were sensitized intranasally with 75 μg LPS-depleted OVA plus 10 μg LPS on days 0, 1, 2, and 7, and then challenged with OVA alone on days 14, 15, 21, and 22. Innate immune responses to LPS were evaluated after sensitization on day 2. Allergen-specific adaptive immune responses were examined after the allergen challenge on day 21. Lung inflammation was examined after the last allergen challenge on day 22. For blockade of VEGFR-1 plus VEGFR-2-mediated signaling, animals were treated i.p. with the pan-VEGFR inhibitor (SU5416) or sham control (DMSO) on days 0, 1, 2, and 7. To evaluate the in vivo effects of VEGF on T cell priming to inhaled allergens, mice were sensitized intranasally with 10 μg mouse recombinant VEGF (rVEGF) plus 75 μg OVA on days 0, 1, and 2, and then challenged with OVA alone on days 7, 8, 14, and 15. BAL cellularity was analyzed as described previously (11). In brief, BAL cellularity was determined by counting 300 inflammatory cells after diluting the cell pellets with 50 μl PBS; inflammatory cells were classified as macrophages, lymphocytes, neutrophils, or eosinophils. Lung sections were stained with H&E after pressure fixation with Streck solution (Streck Laboratories). All sample slides were compared at the same magnification. Lung inflammation was assessed by the degree of peribronchiolar and perivascular inflammation as described previously (11). The levels of cytokines in BAL fluid and cell culture supernatants were measured by ELISA in accordance with the manufacturer’s instructions (R&D Systems). Single-cell suspensions isolated from lung tissues and lung-draining lymph nodes (LNs) were prepared as described previously (25). FACS analysis was performed using mAbs from BD Biosciences: anti-I-A-FITC, anti-CD11c-allophycocyanin, anti-CD11c-PE, anti-CD11c-PE-Cy5, anti-CD11b-PercP, anti-CD11b-allophycocyanin, anti-CD40-PE, and anti-CD86-PE. When necessary, cells were preincubated with anti-CD16/32 mAbs to block cell surface Fc receptors. Cells were analyzed on a FACSCalibur (BD Biosciences) flow cytometer using CellQuest software. Lung-draining LNs were harvested and incubated (4 × 106/ml) in 48-well-plates at 37°C in medium alone or with 100 μg/ml OVA. After 72 h of incubation, culture supernatant was collected to measure the levels of cytokines. For T cell proliferation assay, [3H]thymidine (1 μCi/well) was added and incubated for 18 h, and then cellular thymidine incorporation was measured. Cells isolated from lung tissues and regional LNs (4 × 106/ml) were incubated in 48-well plates coated with anti-CD3 plus anti-CD28 Abs (1 μg/ml each; eBioscience) at 37°C for 6 h and then restimulated with Brefeldin A (10 μg/ml) for 2 h. Cells were stained with surface-specific Abs (anti-CD3-APC, anti-CD4-FITC, and anti-CD8-PE-Cy5; BD Biosciences) for 30 min at 4°C and then fixed for 10 min in 4% paraformaldehyde at room temperature. Cells were incubated with Abs to candidate cytokines (anti-IFN-γ-PE, anti-IL-17-PE, and anti-IL-4-PE; BD Biosciences) for 30 min at room temperature and analyzed on a FACSCalibur flow cytometer (BD Biosciences) using CellQuest software. Cells isolated from lung tissues (4 × 106/ml) were incubated in 48-well plates coated with PMA (50 ng/ml; Sigma-Aldrich) and ionomycin (1 μg/ml; Sigma-Aldrich) at 37°C for 6 h and then restimulated with Brefeldin A (10 μg/ml) for 2 h. Cells were stained with surface-specific Abs (anti-CD11b-APC, anti-CD11c-PE and anti-CD11c-PE-Cy5; BD Biosciences) for 30 min at 4°C and then fixed for 10 min in 4% paraformaldehyde at room temperature. Cells were incubated with Abs to candidate cytokines (anti-IL-12p40-PE and anti-IL-6-PercP; BD Biosciences) for 30 min at room temperature and analyzed on a FACSCalibur flow cytometer (BD Biosciences) using CellQuest software. Single-cell suspensions isolated from lung tissues were prepared as described previously (2). FACS analysis was performed using mAbs from BD Biosciences: anti-CD11b-APC and anti-CD11c-PE-Cy5. To evaluate apoptosis of inflammatory cells, the surface molecules stained cells were incubated with annexin V-FITC. Cells were analyzed on a FACSCalibur (BD Biosciences) flow cytometer using CellQuest software. ANOVA was used to determine the significance of differences among all groups. Significant differences among treatments were assessed by using Student’s t test, ANOVA, or Wilcoxon’s rank sum test. For multiple comparisons, ANOVA was used first, and if significant differences were found, individual t tests or Wilcoxon’s rank sum tests were performed between pairs of groups. Statistical significance was set at p < 0.05. First, we evaluated the production of Th1, Th2, and Th17 cytokines in a time-dependent manner after allergen challenge three times on days 14, 15, and 21 in mice sensitized with OVA plus LPS (Fig. 1⇓A). The number of inflammatory cells in BAL fluid (BAL cellularity) increased significantly from 12 h after allergen challenge compared with the levels before challenge (basal levels; Fig. 1⇓B). In terms of Th1 cytokine production, the levels of IFN-γ in BAL fluid were significantly increased from 4 h after allergen challenge; the levels of IFN-γ-inducible protein (IP)-10 were significantly increased from 12 h after allergen challenge (Fig. 1⇓C). BAL IL-17 levels were significantly enhanced from 4 h after allergen challenge (Fig. 1⇓D). In addition, in vivo production of TNF-α was increased 4 h after allergen challenge in mice sensitized with LPS-contaminated OVA (Fig. 1⇓D). However, the production of Th2 cytokines such as IL-4 and IL-13 was not enhanced after allergen challenge (data not shown). These findings suggest that allergen-induced noneosinophilic inflammation in mice sensitized with LPS-contaminated allergens is related to Th1 and Th17 immune responses to inhaled allergens. Profile of Th1 and Th17 cytokines after allergen challenge in mice sensitized with LPS-contaminated allergen. A, Protocol for generation of noneosinophilic inflammation by sensitization with LPS-contaminated allergen and for evaluation after allergen challenge three times on days 14, 15, and 21. B, BAL cellularity at different time points after allergen challenge. C, Levels of IFN-γ and IP-10 at different time points after allergen challenge. D, Levels of IL-17 and TNF-α at different time points after allergen challenge. B–D, *, p < 0.05 compared with basal level. Data from four mice (C57BL/6 background) in each group are shown in all panels. Based on the observation that IL-17 can induce tissue neutrophilia (16, 18), we evaluated the role of IL-17 in the development of neutrophilic inflammation induced by airway sensitization with LPS-contaminated allergens. For this purpose, the LPS model shown in Fig. 1⇑A was applied to IL-17 KO and wild-type (WT) control mice (BALB/c background). BAL cellularity 48 h after the last allergen challenge on day 22 showed that neutrophil infiltration into the lungs was significantly blocked in the absence of IL-17 (Fig. 2⇓A). With regard to the production of proinflammatory mediators, the levels of TNF-α (possibly a downstream mediator of IL-17) in BAL fluid 48 h after the last allergen challenge were significantly lower in LPS-contaminated OVA-sensitized IL-17 KO mice than in WT controls sensitized in the same manner (Fig. 2⇓B). However, the levels of IP-10 (a downstream mediator of IFN-γ) in BAL fluid were similar in the two groups (Fig. 2⇓B). In combination with the previous observation that neutrophilic inflammation was partly dependent on IFN-γ (11), the present findings indicate that both IFN-γ and IL-17 are key mediators in the development of allergen-induced neutrophilic inflammation in mice sensitized with LPS-contaminated allergens. Th17 immune response is dependent on IL-6 produced by LPS. For figures A and B, evaluation (n = 5 each group) was performed in IL-17−/− and WT (both BALB/c background) mice after allergen challenge. OVA, mice sensitized with OVA alone; OVA/LPS, mice sensitized with OVA plus LPS (10 μg); *, p < 0.05 compared with OVA-sensitized groups; **, p < 0.05 compared with the other groups. A, BAL cellularity 48 h after the final allergen challenge on day 22. B, Levels of TNF-α and IP-10 48 h after the final allergen challenge. Data from five mice in each group are shown in all panels. C, Levels of IL-6 in BAL fluid 6 and 24 h in C57BL/6 WT mice after sensitization with OVA plus LPS (0.1 or 10 μg) three times on days 0, 1, and 2. OVA/LPS(0.1), mice sensitized with OVA plus 0.1 μg LPS; OVA/LPS (10), mice sensitized with OVA plus 10 μg LPS; *, p < 0.05 compared with PBS and OVA-sensitized groups; **, p < 0.05 compared with other groups. For figures D and E, evaluation (n = 5 each group) was performed in IL-6−/− and WT (both C57BL/6 background) mice after allergen challenge. OVA, mice sensitized with OVA alone; OVA/LPS, mice sensitized with OVA plus LPS (10 μg); *, p < 0.05 compared with OVA-sensitized groups; **, p < 0.05 compared with the other groups. D, BAL cellularity 48 h after the final allergen challenge. E, Levels of IL-17 evaluated 6 h after the allergen challenge on day 21. The results of our previous study demonstrated that the IL-12p70 and STAT4 pathway is important in the development of Th1 polarization on exposure to LPS-contaminated allergens (11). The IL-6 and STAT3 pathway is critical in the development of Th17 polarization (26). The present results showed that in vivo production of IL-6 in the airways was significantly enhanced by airway sensitization three times with high-dose (10 μg), but not with low-dose (0.1 μg), LPS with allergens (Fig. 2⇑C). We evaluated the role of IL-6 in the development of allergen-specific Th17 immune response in the airways. For this purpose, the LPS model shown in Fig. 1⇑A was applied to IL-6 KO and WT control mice (C57BL/6 background). BAL cellularity 48 h after the last allergen challenge on day 22 showed that the recruitment of macrophages and neutrophils was significantly decreased in IL-6 KO mice sensitized with LPS-contaminated OVA than in WT mice sensitized in the same manner (Fig. 2⇑D). Moreover, the production of IL-17 after allergen challenge three times on days 14, 15, and 21 was completely blocked in the absence of IL-6 (Fig. 2⇑E), although the production of IFN-γ was unaffected (data not shown). These findings suggest that IL-6 produced by LPS during Ag presentation is critical in the development of allergen-specific Th17 polarization. Previous transgenic animal studies have indicated that overexpression of VEGF in the airways enhances T cell priming to inhaled allergens (23). The results of the present in vivo study showed that VEGF production was significantly enhanced by 3 days of airway sensitization with allergens plus a high dose (10 μg), but not a low dose (0.1 μg), of LPS (Fig. 3⇓A). To evaluate the in vivo effects of VEGF on the development of allergen-specific adaptive immune response, we administered intranasally rVEGF164 (10 μg) with LPS-depleted OVA on days 0, 1, and 2, and then challenge intranasally with OVA alone on days 7, 8, 14, and 15. This study showed that airway sensitization with OVA plus rVEGF augments noneosinophilic inflammation, compared with sensitization with PBS plus rVEGF or PBS alone, when evaluated 48 h after the final allergen challenge (Fig. 3⇓B). 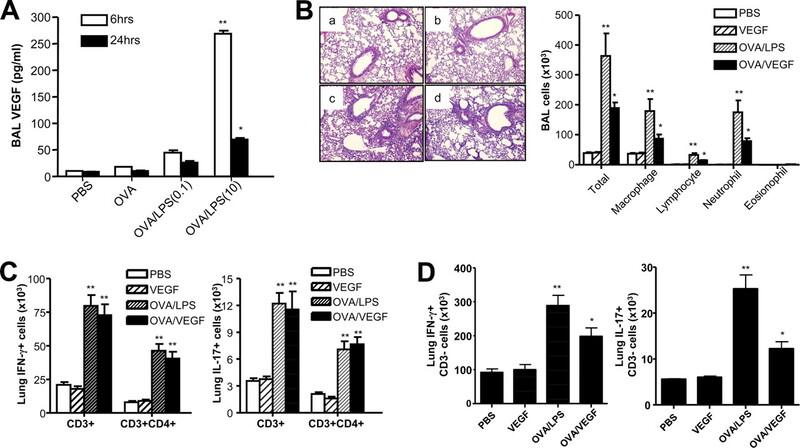 It is interesting that the numbers of both IFN-γ- and IL-17-producing CD3+ and CD3− cells in the lung after the allergen challenge was significantly increased by sensitization with OVA plus rVEGF compared with PBS-sensitized groups (Fig. 3⇓, C and D). Similarly, airway sensitization with OVA plus LPS (10 μg) also induced noneosinophilic inflammation (Fig. 3⇓B); in addition, this kind of sensitization also increased the numbers of both IFN-γ- and IL-17-producing CD3+ and CD3− cells in the lung after the allergen challenge (Fig. 3⇓, C and D). However, the number of IL-4-producing T cells was not enhanced by sensitization with rVEGF or LPS (data not shown). These findings suggest that VEGF produced by LPS during sensitization enhances both Th1 and Th17 adaptive immune responses on exposure to LPS-contaminated allergens. Airway sensitization with allergen plus recombinant VEGF induces noneosinophilic inflammation due to allergen-specific Th1 and Th17 immune responses. A, Levels of VEGF in BAL fluid 6 and 24 h after sensitization with OVA with different doses of LPS three times on days 0, 1, and 2. OVA/LPS (0.1), mice sensitized with OVA plus 0.1 μg LPS; OVA/LPS (10), mice sensitized with OVA plus 10 μg LPS; *, p < 0.05 compared with PBS and OVA sensitized groups; **, p < 0.05 compared with other groups. B, Representative lung histology (left) and BAL cellularity (right) 48 h after the final allergen challenge. a, PBS; b, VEGF; c, OVA/LPS; d, OVA/VEGF (H&E stain, ×100). The numbers of IFN-γ- and IL-17-producing CD3+ and CD3+CD4+ cells (C) and CD3− cells (D) 24 h after OVA stimulation was shown. For Figures C and D, lung cells were isolated 6 h after three successive allergen challenges on day 7, 8, and 14. B–D, PBS, mice sensitized with PBS; VEGF, mice sensitized with recombinant VEGF alone; OVA/LPS, mice sensitized with OVA plus LPS (10 μg); OVA/VEGF, mice sensitized with OVA plus recombinant VEGF; *, p < 0.05 compared with the PBS sensitized group; **, p < 0.05 compared with other groups. Data from five C57BL/6 WT mice in each group are shown in all panels. Based on the observation that airway sensitization of LPS-contaminated allergens induced lung inflammation as a result of Th1 and Th17 immune responses to allergens, we evaluated the role of VEGFR-mediated signaling in the development of allergen-specific adaptive immune responses induced by airway sensitization with LPS-contaminated allergens. An inhibitor of both VEGFR-1 and VEGFR-2 signaling (pan-VEGFR inhibitor, SU5416) and sham (DMSO) was used during sensitization (on days 0, 1, 2, and 7) followed by challenge with allergen alone on days 14, 15, 21, and 22 in the LPS model. The results of the present study indicate that BAL cellularity 48 h after the final allergen challenge was reduced by the pan-VEGFR inhibitor in a dose-dependent manner (Fig. 4⇓A). To further evaluate the role of VEGFR-mediated signaling, we injected 10 mg/kg of the pan-VEGFR inhibitor i.p. during sensitization (on days 0, 1, 2, and 7). In terms of the production of Th1 and Th17 cytokines, the levels of both IFN-γ and IL-17 in BAL fluid 6 h after allergen challenge three times on days 14, 15, and 21 decreased significantly in LPS-contaminated OVA-sensitized inhibitor-treated mice compared with those in sham-treated controls sensitized in the same manner (Fig. 4⇓B). Moreover, the levels of allergen-specific production of both cytokines in lung draining regional LN cells evaluated 6 h after allergen challenge on day 21 were significantly inhibited in the former group in comparison to the latter (Fig. 4⇓C). However, the percentage of CD4+ and CD8+ T cells in lung-draining LNs was not affected by blockade of VEGFR signaling (Fig. 4⇓D). These findings suggest that VEGFR-mediated signaling during Ag presentation is important in the development of allergen-specific Th1 or Th17 immune responses in mice sensitized with LPS-contaminated allergens. VEGFR-mediated signaling during sensitization plays an important role in the development of allergen-specific Th1 and Th17 adaptive immune responses. A–D, Evaluation (n = 5 each group) was performed in C57BL/6 WT mice after allergen challenge. A, Representative lung histology (left) and BAL cellularity 48 h after the final allergen challenge according to treatment with different doses of a pan-VEGFR inhibitor (SU5416, SU) during sensitization. a, OVA_sham; b, OVA/LPS_sham; c, OVA/LPS_SU (1); d, OVA/LPS_SU (10) (H&E stain, ×100). B, Levels of IFN-γ and IL-17 in BAL fluid 6 h after allergen challenge three times on days 14, 15, and 21 following treatment with 10 mg/kg SU5416 (SU) during sensitization. C, Levels of IFN-γ and IL-17 in supernatants of T cells 24 h after stimulation with PBS or OVA (100 μg/ml) isolated from lung-draining LNs 6 h after allergen challenge following treatment with 10 mg/kg SU5416 (SU) during sensitization. D, The proportion of CD4+ and CD8+ T cells in lung-draining LNs. We evaluated the role of VEGFR-mediated signaling in the LPS-induced innate immune response. Application of the pan-VEGFR inhibitor (10 mg/kg) was performed during sensitization, and evaluation was performed after sensitization three times on days 0, 1, and 2 in the LPS model. BAL cellularity 24 h after sensitization showed that recruitment of inflammatory cells, especially macrophages and neutrophils, induced by LPS was significantly blocked by treatment with the pan-VEGFR inhibitor compared with sham-treated controls (Fig. 5⇓A). 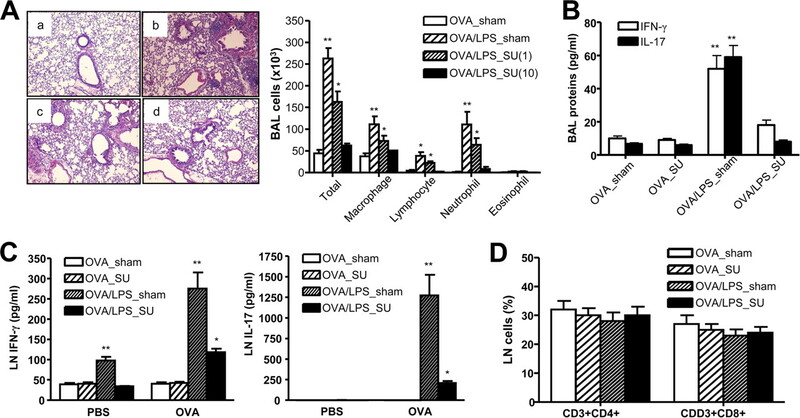 In addition, apoptosis of inflammatory cells in lung tissues was not enhanced in OVA/LPS-sensitized mice treated with VEGFR inhibitor compared with OVA-sensitized mice, although that enhanced in sham-treated, OVA/LPS-sensitized mice (Fig. 5⇓B). Meanwhile, the expression of costimulator molecules (MHC class II, CD40, and CD86) on lung DCs enhanced by LPS was significantly reduced by treatment with the pan-VEGFR inhibitor (Fig. 5⇓C). Moreover, the proportion of DCs and MHC class II+ DCs in LNs enhanced by LPS was also not increased by blockade of VEGFR signaling (Fig. 5⇓D). Taken together, these findings suggest that VEGFR signaling is important in the development of recruitment of inflammatory cells and DC maturation and migration into regional LNs. VEGFR-mediated signaling during sensitization plays a key role in the development of innate immune response induced by airway exposure of LPS. A–G, Evaluation (n = 5 each group) was performed in C57BL/6 WT mice after sensitization three times on days 0, 1, and 2. A, BAL cellularity (left) and lung CD11b+ and CD11c+ cells in lung tissues (right) 24 h after sensitization following treatment with 10 mg/kg SU5416 (SU). B, The proportion of annexin V+ cells in lung tissues 24 h after sensitization. C, Numbers of lung CD11c+ cells (DC) expressing costimulatory molecules, such as MHC class II, CD40, and CD86, 24 h after sensitization. D, The proportion of CD11c+ and CD11c+ MHC class IIhigh cells in lung-draining LNs 24 h after sensitization. E, Ratio of thymidine uptake of T cells isolated from lung-draining LNs 72 h after stimulation with OVA (100 μg/ml) or PBS; cells were isolated 72 h after sensitization. F, Levels of IL-12p70 and IL-6 in BAL fluid 24 h after sensitization following treatment with 10 mg/kg SU5416 (SU). G, The proportion of IL-12- and IL-6-producing cells in lung tissues 24 h after sensitization. For all figures: *, p < 0.05 compared with mice sensitized with OVA alone; **, p < 0.05 compared with the other groups. Finally, we evaluated the role of VEGFR-mediated signaling in the LPS-induced T cell priming and its polarization to Th1 or Th17 cells. To test this, mice were injected i.p. with the pan-VEGFR inhibitor (10 mg/kg), and then evaluated after sensitization three times on days 0, 1, and 2 in the LPS model. This study showed that allergen-specific proliferation of lung-draining LN cells, evaluated 72 h after allergen sensitization, was significantly enhanced by LPS; in addition, the enhanced proliferation of LN cells was blocked completely by treatment with the inhibitor (Fig. 5⇑E). In terms of the production of Th1 and Th17 cytokines, both Th1 polarizing (IL-12p70) and Th17 polarizing (IL-6) cytokines in BAL fluid 24 h after sensitization decreased significantly in OVA/LPS-sensitized inhibitor-treated mice compared with sham-treated mice sensitized in the same manner (Fig. 5⇑F). Moreover, the proportion of IL-12- and IL-6-producing DCs in lung tissues, enhanced by LPS, was completely blocked by treatment of the inhibitor (Fig. 5⇑G). 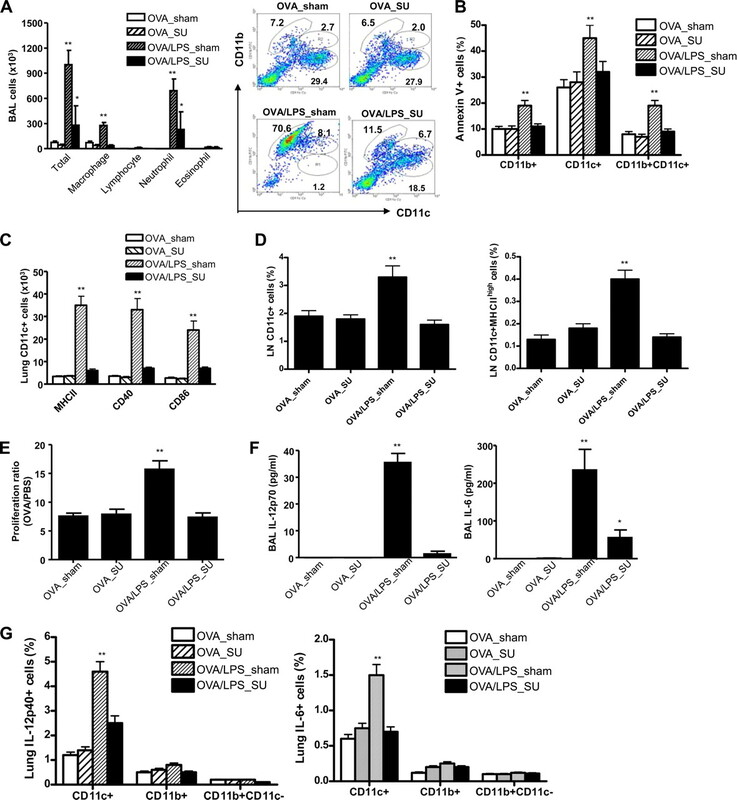 These findings indicate that VEGF and its receptor-mediated signaling play an important role in the proliferation of naive T cells, possibly via enhancing DC maturation and migration into regional LNs, and that VEGFR signaling is also important for primed T cells to differentiate to Th1 and Th17 cells, possibly via up-regulation of the production of Th1 and Th17 polarizing cytokines. There is increasing evidence that inflammatory mechanisms other than eosinophilic inflammation (noneosinophilic asthma) are involved in the pathogenesis of asthma (11, 27). In addition, a European Network for Understanding Mechanisms of Severe Asthma (ENFUMOSA) cross-sectional European multicenter study indicated that patients with more severe disease differ from the mild to moderate group by having increased sputum neutrophil counts (28). For more than 20 years, immunologists have divided helper T cells into two functional subsets: Th1 and Th2 cells (29). In terms of the role of T cell-derived cytokines in the development of noneosinophilic asthma, there is a great deal of evidence that neutrophilic inflammation, especially in severe asthma, is related to Th1 cytokine expression (IFN-γ) rather than to Th2 cytokines (11, 30). Our animal studies demonstrated that noneosinophilic asthma induced by LPS-containing allergens is partly dependent on IFN-γ (11), indicating that the allergen-specific Th1 immune response is important in the development of noneosinophilic inflammation. Recently, Th17 cells producing IL-17 have been identified (15); IL-17 acts in vitro and in vivo as a potent mediator of the development of neutrophilic inflammation (17). Unfortunately, the precise role of the Th17 immune response in the development of neutrophilic inflammation that characterizes noneosinophilic or severe asthma is still unknown. The present data show that, on exposure to LPS-containing allergens, noneosinophilic inflammation in the airways is partly mediated by allergen-specific Th17 immune responses. These findings suggest that both Th1 and Th17 immune responses are important in the development of noneosinophilic asthma, whereas Th2 immune responses are important in eosinophilic asthma. The mechanism by which Th17 cells are polarized from naive T cells has been studied extensively; IL-6, in synergy with TGF-β, induces IL-17 expression in T cells via the STAT3-RORγt pathway (31). Our in vivo study shows that the production of IL-6 is enhanced by high-dose LPS, but not by a low dose. Moreover, the Th17 immune response induced by an allergen plus high-dose LPS is abolished in IL-6-deficient mice. These findings indicate that, on exposure to LPS-containing allergens, IL-6 is a key mediator in the development of the allergen-specific Th17 immune response. VEGF is produced during the innate immune response induced by LPS (32). VEGF is a potent mediator of vascular remodeling and angiogenesis in the lung (23). In addition, overexpression of VEGF in the airways augments T cell priming to inhaled allergens along with enhanced expression of costimulatory molecules on lung DCs (23). The present studies indicate that airway exposure to high-dose (10 μg) LPS up-regulates the production of VEGF; rVEGF enhances T cell priming on exposure to allergens alone. Moreover, the present study shows that LPS-induced effects on the T cell priming (e.g., recruitment of inflammatory cells, overexpression of costimulatory molecules on DCs and DC migration into regional LNs, and subsequent proliferation of naive T cells) are also blocked by treatment with the pan-VEGFR inhibitor. These findings suggest that VEGF induced by LPS is a key mediator in the development of T cell priming to allergens on exposure to LPS-containing allergens. In terms of the effects of VEGF on the differentiation of primed T cells, some evidence suggested that VEGF enhances Th1 polarization (33), although the effects of VEGF on Th17 polarization are wholly unknown. The present studies indicate that rVEGF enhances both Th1 and Th17 immune responses on exposure to allergens alone. In addition, the present study shows that noneosinophilic inflammation induced by allergen-specific Th1 and Th17 immune responses is abolished by blockade of VEGFR-mediated signaling during Ag presentation. Moreover, the production of Th1 and Th17 polarizing cytokines enhanced by LPS was also blocked by treatment with the pan-VEGFR inhibitor. These findings indicate that VEGF produced by LPS exposure is involved in the differentiation to Th1 and Th17 cells from primed T cells, via up-regulation of the Th1 and Th17 polarizing cytokines. In summary, we speculated on the immunological mechanisms of T cell priming to inhaled allergens and then polarization to Th1 and Th17 cells on exposure to LPS-containing allergens, as shown in Fig. 6⇓. When a subject inhales LPS-containing allergens, pattern-recognition receptor (TLR4)–mediated signaling in airway epithelial cells and DCs after binding LPS produces VEGF, which mediates the recruitment of inflammatory cells mainly via VEGFR-mediated pathway in vascular endothelial cells. Recruited monocytes and/or resident immature DCs are differentiated into mature DCs, in which the expression of costimulatory molecules and migration into regional LNs are enhanced via VEGFR-mediated signaling. During migration of mature DCs into lung draining LNs, DCs gain the ability to produce both the Th1 (IL-12) and Th17 (IL-6) polarizing cytokines via VEGFR-mediated pathway. In lung-draining regional LNs, mature DCs induce proliferation of naive T cells via antigenic and costimulatory stimuli and then proliferated T cells are differentiated into Th1 and Th17 cells via IL-12 and IL-6 produced by VEGF and VEGFR-mediated pathways in mature DCs. 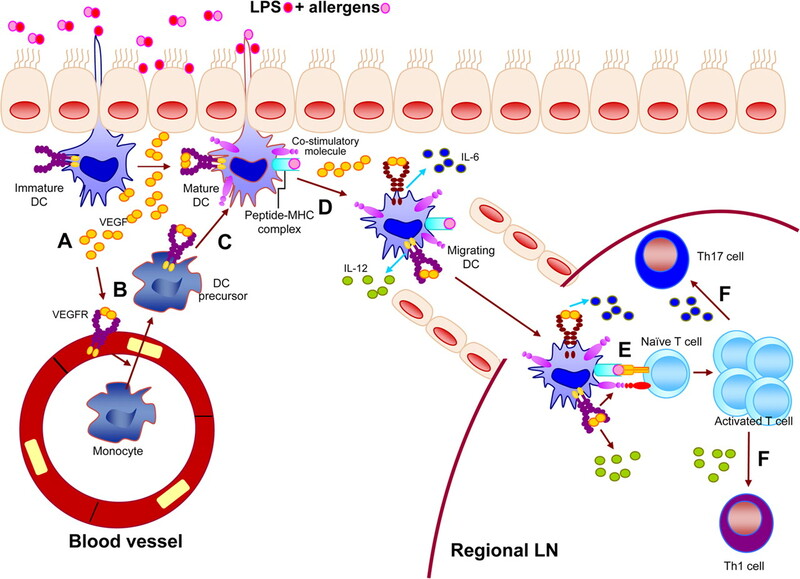 Speculation regarding the immunopathogenesis of T cell priming to inhaled allergens and its polarization to Th1 and Th17 cells on exposure to LPS-containing allergens. When a subject inhales LPS-containing allergens, pattern-recognition receptor (TLR4) signaling in airway epithelial cells and DCs after binding LPS produces VEGF (A), which mediates the recruitment of inflammatory cells via VEGFR-mediated signaling in vascular endothelial cells (B). After inflammatory cells are recruited into the lung, recruited monocytes and resident immature DCs are differentiated into mature DCs, in which the expression of costimulatory molecules is enhanced via VEGFR-mediated signaling (C). During migration of mature DCs into lung-draining LNs which is enhanced by VEGF, DCs gain the ability to produce IL-12p70 and IL-6 via VEGFR-mediated signaling (D). In lung draining LNs, mature DCs induce proliferation of naive T cells via antigenic and costimulatory stimuli (E). Then, IL-12p70 and IL-6 produced by mature DCs induce differentiation of activated T cells into Th1 and Th17 cells, respectively (F). We thank Jee-In Lim for the providing secretarial assistance and Sun-Ok Kang for experimental help. ↵1 This study was supported by grants from the Korea Ministry of Health and Welfare, Republic of Korea (03-PJ10-PG13-GD01-0002, A050193, A050288, and A080711), and the Korea Science and Education Foundation (R01-2007-000-11026-0) to Y.K.K. and by National Institutes of Health Grant HL079349 to Z.Z. ↵3 Abbreviations used in this paper: VEGF, vascular endothelial growth factor; VEGFR, vascular endothelial growth factor receptor; KO, knockout; rVEGF, recombinant VEGF; BAL, bronchoalveolar lavage; DC, dendritic cell; LN, lymph node; IP-10, IFN-γ-inducible protein-10; WT, wild type. Gereda, J. E., D. Y. Leung, A. Thatayatikom, J. E. Streib, M. R. Price, M. D. Klinnert, A. H. Liu. 2000. Relation between house-dust endotoxin exposure, type 1 T-cell development, and allergen sensitisation in infants at high risk of asthma. Lancet 355: 1680-1683. Akbari, O., G. J. Freeman, E. H. Meyer, E. A. Greenfield, T. T. Chang, A. H. Sharpe, G. Berry, R. H. DeKruyff, D. T. Umetsu. 2002. Antigen-specific regulatory T cells develop via the ICOS-ICOS-ligand pathway and inhibit allergen-induced airway hyperreactivity. Nat. Med. 8: 1024-1032. Asher, M. I., S. Montefort, B. Bjorksten, C. K. Lai, D. P. Strachan, S. K. Weiland, H. Williams. 2006. Worldwide time trends in the prevalence of symptoms of asthma, allergic rhinoconjunctivitis, and eczema in childhood: ISAAC Phases One and Three repeat multicountry cross-sectional surveys. Lancet 368: 733-743. Michel, O.. 2003. Role of lipopolysaccharide (LPS) in asthma and other pulmonary conditions. J. Endotoxin Res. 9: 293-300. Braun-Fahrlander, C., J. Riedler, U. Herz, W. Eder, M. Waser, L. Grize, S. Maisch, D. Carr, F. Gerlach, A. Bufe, et al 2002. Environmental exposure to endotoxin and its relation to asthma in school-age children. N. Engl. J. Med. 347: 869-877. Dahl, M. E., K. Dabbagh, D. Liggitt, S. Kim, D. B. Lewis. 2004. Viral-induced T helper type 1 responses enhance allergic disease by effects on lung dendritic cells. Nat. Immunol. 5: 337-343. Xu, X., Z. Fang, B. Wang, C. Chen, W. Guang, Y. Jin, J. Yang, S. Lewitzky, A. Aelony, A. Parker, et al 2001. A genomewide search for quantitative-trait loci underlying asthma. Am. J. Hum. Genet. 69: 1271-1277. Hogg, J. C.. 1999. Childhood viral infection and the pathogenesis of asthma and chronic obstructive lung disease. Am. J. Respir. Crit. Care Med. 160: S26-S28. Kim, Y. K., S. Y. Oh, S. G. Jeon, H. W. Park, S. Y. Lee, E. Y. Chun, B. Bang, H. S. Lee, M. H. Oh, Y. S. Kim, et al 2007. Airway exposure levels of lipopolysaccharide determine type 1 versus type 2 experimental asthma. J. Immunol. 178: 5375-5382. Holtzman, M. J., D. Sampath, M. Castro, D. C. Look, S. Jayaraman. 1996. The one-two of T helper cells: does interferon-γ knock out the Th2 hypothesis for asthma?. Am. J. Respir. Cell Mol. Biol. 14: 316-318. Magnan, A. O., L. G. Mely, C. A. Camilla, M. M. Badier, F. A. Montero-Julian, C. M. Guillot, B. B. Casano, S. J. Prato, V. Fert, P. Bongrand, D. Vervloet. 2000. Assessment of the Th1/Th2 paradigm in whole blood in atopy and asthma: increased IFN-γ-producing CD8+ T cells in asthma. Am. J. Respir. Crit. Care Med. 161: 1790-1796. Cho, S. H., L. A. Stanciu, S. T. Holgate, S. L. Johnston. 2005. Increased interleukin-4, interleukin-5, and interferon-γ in airway CD4+ and CD8+ T cells in atopic asthma. Am. J. Respir. Crit. Care Med. 171: 224-230. McKinley, L., J. F. Alcorn, A. Peterson, R. B. Dupont, S. Kapadia, A. Logar, A. Henry, C. G. Irvin, J. D. Piganelli, A. Ray, J. K. Kolls. 2008. TH17 cells mediate steroid-resistant airway inflammation and airway hyperresponsiveness in mice. J. Immunol. 181: 4089-4097. Linden, A., H. Hoshino, M. Laan. 2000. Airway neutrophils and interleukin-17. Eur. Respir. J. 15: 973-977. Senger, D. R., L. Van de Water, L. F. Brown, J. A. Nagy, K. T. Yeo, T. K. Yeo, B. Berse, R. W. Jackman, A. M. Dvorak, H. F. Dvorak. 1993. Vascular permeability factor (VPF, VEGF) in tumor biology. Cancer Metastasis Rev. 12: 303-324. Hoshino, M., M. Takahashi, N. Aoike. 2001. Expression of vascular endothelial growth factor, basic fibroblast growth factor, and angiogenin immunoreactivity in asthmatic airways and its relationship to angiogenesis. J. Allergy Clin. Immunol. 107: 295-301. Lee, C. G., H. Link, P. Baluk, R. J. Homer, S. Chapoval, V. Bhandari, M. J. Kang, L. Cohn, Y. K. Kim, D. M. McDonald, J. A. Elias. 2004. Vascular endothelial growth factor (VEGF) induces remodeling and enhances TH2-mediated sensitization and inflammation in the lung. Nat. Med. 10: 1095-1103. Park, H. W., J. E. Lee, E. S. Shin, J. Y. Lee, J. W. Bahn, H. B. Oh, S. Y. Oh, S. H. Cho, H. B. Moon, K. U. Min, et al 2006. Association between genetic variations of vascular endothelial growth factor receptor 2 and atopy in the Korean population. J. Allergy Clin. Immunol. 117: 774-779. Vermaelen, K., R. Pauwels. 2003. Accelerated airway dendritic cell maturation, trafficking, and elimination in a mouse model of asthma. Am. J. Respir. Cell Mol. Biol. 29: 405-409. Chen, X., O. M. Howard, J. J. Oppenheim. 2007. Pertussis toxin by inducing IL-6 promotes the generation of IL-17-producing CD4 cells. J. Immunol. 178: 6123-6129. Douwes, J., P. Gibson, J. Pekkanen, N. Pearce. 2002. Non-eosinophilic asthma: importance and possible mechanisms. Thorax 57: 643-648. The ENFUMOSA cross-sectional European multicentre study of the clinical phenotype of chronic severe asthma: European Network for Understanding Mechanisms of Severe Asthma. Eur. Respir. J. 22: 2003470-477. Mosmann, T. R., H. Cherwinski, M. W. Bond, M. A. Giedlin, R. L. Coffman. 1986. Two types of murine helper T cell clone, I: definition according to profiles of lymphokine activities and secreted proteins. J. Immunol. 136: 2348-2357. Hahn, R. G.. 2003. Endotoxin boosts the vascular endothelial growth factor (VEGF) in rabbits. J. Endotoxin Res. 9: 97-100. Mor, F., F. J. Quintana, I. R. Cohen. 2004. Angiogenesis-inflammation cross-talk: vascular endothelial growth factor is secreted by activated T cells and induces Th1 polarization. J. Immunol. 172: 4618-4623.